Steve Gullberg, II, Spaatz #1465 died suddenly on Monday, 2 December 2013, in a plane crash in Puerto Rico. Steve was the first second-generation Spaatz award recipient, son of Spaatz #439, Lt Col Steven Gullberg. Below is a brief excerpt summarizing Steve’s extraordinary life. Steven earned a Bachelor’s degree from the University of Oklahoma in 2008. While in college he started two very successful internet businesses marketing electronics, one of which he maintained until deciding to re-enter flight training to do what he loved the most – fly. Steve had been exposed to airplanes and flying since before he was born, flying with us while I taught Jessica to fly while she was pregnant with him. After his birth we continued flying with him in a car seat behind us in the airplane. By the time he could talk he said that when he grew up he wanted to fly. I took him flying from time to time and took him on the airline trips I was flying as well. One time we headed on a trip to Sweden for the weekend on a day’s notice. TWA had me teaching pilots to fly our airplanes in simulators and I would take him there and let him fly too. I also picked up a new MD-80 from the factory in Long Beach, CA – Steve came along and flew back to Kansas City with me riding in the cockpit. Steve soloed a glider when he was 14 and I, as his instructor, soloed him in a Cessna 172 on his 16th birthday. He joined the Civil Air Patrol as a cadet as he entered the sixth grade. Steve loved the airplanes and all of the other aspects of the program. It was with CAP that he flew gliders and received orientation flights on military aircraft as well. He rose rapidly through the ranks, becoming the cadet commander of his squadron. He attended CAP’s Air Force Pararescue Orientation Course at Kirtland AFB, NM, and went on the International Air Cadet Exchange to Australia. Ultimately Steve earned Civil Air Patrol’s highest cadet honor – the General Carl A. Spaatz Award. He was the 1465th cadet to do so in the long history of the achievement and this promoted him to the rank of Cadet Colonel. His father earned the 439th Spaatz Award when he was a cadet and Steven became CAP’s first second-generation Spaatz Award recipient. Steven played football all four years that he attended Hazelwood Central High School. He also was honored as a division winner at the Greater St Louis Science Fair at Queeny Park for a project he that did showing the boundary layer separation of the airflow over the upper surface of a wing in accordance with changes in the wing’s angle of attack. Steve was a graduate of the University of Oklahoma and played football for Hazelwood Central High School. He was a Cadet Colonel in the Civil Air Patrol and a member of St. Peters United Church of Church. ST. LOUIS, MO (KTVI)– A St. Louis family is looking for answers as to how their loved one died in a horrific plane crash in Puerto Rico. The family of 28-year-old Steven Gullberg was looking forward to a holiday season filled with happiness and joy. Now they`re faced to deal with tragedy and loss. On Monday night, Steven and a co-pilot were flying a cargo plane from the Dominican Republic along Puerto Rico`s north coast when somehow the plane made a rapid decent and crashed, there were no survivors. Steven`s brother Greg says now his family is questioning how the plane was maintained. They`re also keeping tabs on reports from Puerto Rico. “It`s shocking to have a fun night in with your family and then suddenly get a call that says you don`t have a brother anymore. I don`t know how to think or feel. I want to know what happened, why it happened and who`s responsible,” said Gullberg. 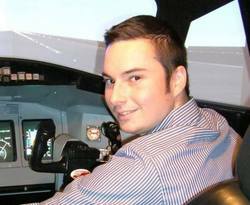 The Hazlewood Central High School and Oklahoma Sooner graduated and went on to live his dream of becoming a pilot just like his dad. Gullberg had been working for Fort Lauderdale based IBC Airways for less than 6 months and had years of flying experience. “It looks like more than a simple crash. As a matter of fact all of the flight data shows that the plane just dropped out of the sky. Steven was such a great person, I have never met anyone who was so courageous and brave,” he said. The family is going through the process of identifying Steven’s body and making funeral arrangements. Fox 2 also contacted IBC Airways for a comment on the incident but so far no response. The FAA is investigating the incident. Steven’s crew was flying a 1986 cargo-converted SA227-AC for IBC Airways of Fort Lauderdale. They were flying a scheduled IFR night flight. The NTSB report status is ‘preliminary’ but it’s normal for accidents like this to take more than one year for the NTSB to publish a probable cause. Search NTSB ERA14MA060 for the latest information.